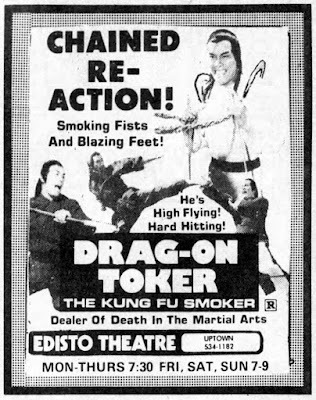 The "high flying" and "hard hitting" kung fu joint called DRAG-ON TOKER (THE KUNG FU SMOKER) beat Cheech & Chong's UP IN SMOKE to theaters by at least six months. Here it is in Orangeburg, SC on March 10, 1978. "What the hell is the real title" you ask? It's actually SHAO LIN BAN PAN TU (1977) a.k.a. SHAOLIN TRAITOR. Mmm, good stuff!